As each year closes, I find myself thinking about the “high water mark film”—the movie that did the most in the past year to raise the bar for filmmaking as a whole. This doesn’t mean it will be the Best Picture winner (although it’s almost always at least a nominee). Rather it’s an entirely subjective judgement in my own mind of how much a particular film did to push the cinematic envelope. The script had me cheering for screenwriter Graham Moore. Yes, it stretched the truth. But it did so with so much elegance and beauty that this artistic license should be granted by the Academy itself. If director Morten Tyldum is not at least nominated by the Academy, I’m boycotting the Oscars. This isn’t just BBC good, this sets a new bar for period dramas where every last detail makes a difference. And at the center of it all is the sheer brilliance and moral power of Alan Turing. Almost no man alive can fully appreciate the impact he has had on the world we live in today. He’s been one of the great unsung intellectual heros of modern times—and this, finally, is his song. 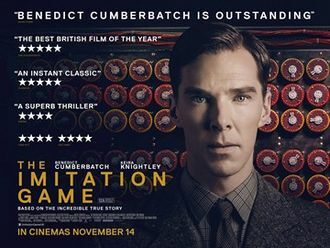 This entry was posted in Movies and tagged Alan Turing, Benedict Cumberbatch, Graham Moore, Gravity, Interstellar, Morten Tyldum, The Imitation Game. Bookmark the permalink.